Matthew Templeton put away two goals. There’s one round to go for Division One and it’s finals time for Division Two. Division One is as close as ever, with Woori Yallock one game clear on top. Olinda, Wandin and Upwey are fighting it out for the second chance and Healesville are just one game clear in fifth spot with Mount Evelyn nipping at their heels. Emerald jumped out of the box, kicking 8.6 to one behind and the game was out of Warburton’s reach from quarter time. 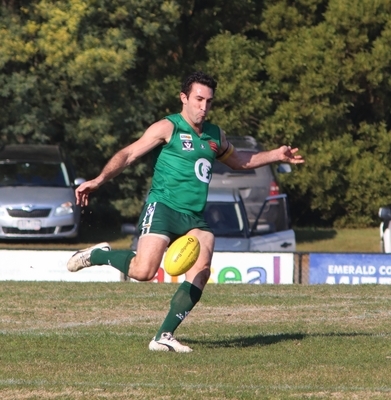 Emerald kicked six goals to three in the second to have a lead of 73 points at half time. They piled on another 12 goals to 7 in the second half. Emerald best: S. Kelleher (4 goals), Mat Dompietro (1 goal), J. Marshall, J. Bishop (1 goal), N. Jansen, S. Kapahnke. Warburton Millgrove best: L. Barnard, B. Ferguson, J. Blake, A. White (4 goals), T. McKenzie (1 goal), S. Andueza. Monbulk got the early advantage, kicking five goals to three in the first. They held tough in the second but only led by three points at half time. 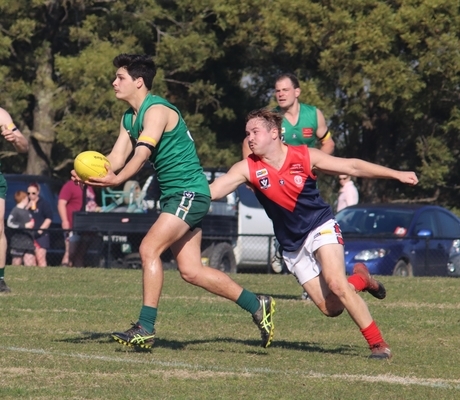 Healesville came out to play in the second half kicking six goals to two to have a lead of 21 points at three quarter time. Healesville best: J. Nugent, R. Woodford (4 goals), B. Murphy (2 goals), J. Roe-Duggan (1 goal), N. Mende (1 goal), K. Niki (3 goals). Mount Evelyn jumped Olinda in the first, taking a lead of two points into quarter time. Olinda started to play their brand of footy kicking seven goals to three in the second to take the lead by 24 points at half time. They held Mount Evelyn to just two goals in the second half while they manufactured eight. Olinda Ferny Creek best: C. Eade, M. Hottes, J. Charge (3 goals), E. Greenall, L. Taylor (4 goals), D. Troutman (1 goal). Mount Evelyn best: D. Kift (1 goal), T. Hallett-Tauali’’I (1 goal), R. Fooks (1 goal), D. O’Connor, D. Watson, M. Brierley. Wandin got the better start and had a slim five-point lead at quarter time. They opened that gap to 44 points at half time, holding Upwey Tecoma goalless in the second. Wandin kicked another 10 goals to four in the second half. Wandin best: P. Bruzzese (1 goal), B. Harvey, J. Ladner (2 goals), R. Heasley, C. Johnston (6 goals), B. Smith. Upwey Tecoma best: T. Holland, W. Duncan, B. Oates (1 goal), K. Hinton, L. Van Mourik, B. Bantoft. Woori Yallock got off to a flyer, kicking eight goals to one in the first, and was never troubled from there. A big nine goal to one second quarter and the lead was out to 94 points. Woori kicked 13 goals in the second half. Woori Yallock best: J. Matthews (10 goals), C. Smedley (2 goals), E. Clasby (4 goals), R. Monkhorst, J. Adams (1 goal). Belgrave best: M. O’Callaghan, J. Brown, P. Gough, M. Sproules, C. Rak, J. Davies. Kinglake got the early lead in the first by just six points. They opened that lead, kicking seven goals in the second, and kept Alexandra to just two. The third quarter was a tight contest, but the lead was still in Kinglake’s favour by 36 points. Kinglake lost all its run in the last and could only manage 1.1 while Alexandra came storming home kicking 6.3. Kinglake best: J. Crowe, M. Quinton, W. Graf (2 goals), J. Butterworth, M. McAllister (1 goal), A. McLaren. Alexandra best: B. Cooper (3 goals), M. Whitbourn, P. Ferguson, C. Heaslip, J. Goonan, S. Steiner (1 goal). Powelltown held the early lead by four points at quarter time. Gembrook won the second quarter kicking 3.5 to 1.3 to go into the main break with a 10-point lead. Powelltown found something in the third and fought back to be only four points down at the last change. Gembrook held the Demons to just one goal in the last. Gembrook Cockatoo best: M. Firrito (23 goals), P. Gramc (5 goals), D. Welsh, J. Gibson, D. Volta, P. Backman. Powelltown best: J. Garthwaite (1 goal), J. Moore (1 goal), J. Iacono (1 goal), S. Halliday, B. Wratten (1 goal), M. McArthur (1 goal). Nathan O’Keefe won the Division Two goal kicking after another record score against a Thornton Eildon side that will start to rebuild for next season. Seville best: N. O’Keefe (25 goals), M. Cecere (4 goals), J. Cecere (6 goals), J. Neal (11 goals), D. Broadway (4 goals), D. Groen (1 goal). 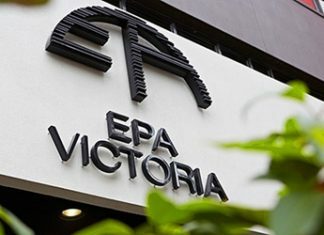 Thornton Eildon best: B. Davis, B. Azzopardi, R. Andrews, J. Scotland, W. Cody, B. McComb. Yarra Junction started well, kicking 4.2 to 3.1 in the first, but Yarra Glen bounced back in the second to lead by 21 points at half time. They held the Eagles to 1.3 in the third while they kicked 6.8 to have a healthy lead of 56 points at the last change. It was a bit of self- preservation in the last for both teams. Yarra Glen best: B. Ashton (1 goal), D. Hurley, A. Moate (6 goals), A. Smith (1 goal), J. Symes, J. Schille (2 goals). Yarra Junction best: D. Brookes, B. Clark (1 goal), C. Hoare, P. Cubbin, L. Hoffman (1 goal), T. Wheeler (3 goals). Warburton Millgrove best: C. Sinniah (1 goal), J. Farrugia (1 goal), M. Knight (3 goals), R. Nyko, T. Walker, J. Cahill (3 goals). Emerald best: J. Raukola, A. Kapahnke, B. Lewis, N. Stuhldreier, J. Zimmerling (1 goal), B. Walker. Healesville best: C. Boeder, A. Peterson, J. Lawry, J. Brookes, C. Wright (1 goal), R. McQueen. Monbulk best: S. Smith, D. Ross, S. Ross, B. Rutherford, A. Richardson, S. Bennett. Gembrook Cockatoo best: Z. Loewe, J. Burchill, M. Wareham, H. Snoxell, F. Trott (2 goals), M. Frazzetto. Mount Evelyn best: J. Hattwell, N. Hoskin, H. Watson, J. Day, M. Greenway, L. Walker. Upwey Tecoma best: K. Weiser, C. Jones, B. Burrows, A. Grenda (3 goals), J. Goldie (2 goals), J. Sheehan (1 goal). Wandin best: M. Feakes, A. Mandl, C. Steiner, B. Ebeyer, J. Daemen (2 goals), D. Wathen. Woori Yallock best: J. Aitchison (6 goals), C. French (1 goal), J. O’Sullivan (4 goals), R. Whitworth (1 goal), R. Foy, H. Bansagi (1 goal). Alexandra best: H. Gilmore, J. Keath (1 goal), T. Rouget (3 goals), N. Stewart, Z. Pedlar, W. Woolford. Belgrave sits second after defeating fourth-placed Woori Yallock. Belgrave took the early lead by two goals at quarter time. They broke away in the second and led by seven goals at half time. Woori Yallock won the third quarter but only by one goal. Belgrave took control in the last. Belgrave best: L. Bennett (22 goals), A. Jeffery, K. Bradshaw. Woori Yallock best: J. Evans, M. Hargrave (31 goals), A. Newham. Wandin sits third on the ladder and were challenged by eighth-placed Upwey on Saturday. Wandin got up and going in the second and had a lead of eight goals at half time. The third quarter was all square with 13 goals each. Upwey completely dominated in the last shooting 14 goals to six. Upwey Tecoma best: T. Edelmaier, G. Bull (13 goals), P. Day. Wandin best: K. Dolphin, R. McMahon, C. Seivers. Monbulk took control in the second and led by seven goals. It was all Monbulk in the third and they led by 18 goals at three quarter time. Healesville rallied in the last. Monbulk best: K. Seamer, T. Mancarella, B. Williams (42 goals). Healesville best: L. Wandin-Collins (8 goals), C. Chandler, A. Bryan. Warburton held a three-goal lead at quarter time. They opened that up to 12 at half time. The third quarter was all Warburton and a lead of 21 goals was going to be hard to peg back. Emerald took it up to them in the last, but it was all too late. Warburton Millgrove best: N. Petrucev, K. Luiyf (21 goals), S. Fotia. Emerald best: E. Loveday, J. Scott, H. Scott. Olinda will probably claim the minor premiership. The side shot an impressive 18 goals in the first to lead by nine. Mount Evelyn held them to 15 in the second but the lead was 14 goals at half time. Mount Evelyn could only manage four goals in the third and the game had slipped away from them. Olinda Ferny Creek best: K. Tomlinson, B. Smith, A. Paget. Mount Evelyn best: K. Black (15 goals), G. Bingley, S. Jones. Powelltown best: A. Martin, N. Hajder (48 goals), J. Lord. Gembrook Cockatoo best: A. Frost, K. Dullard, K. Clark (2 goals). Yarra Junction best: A. Finn (21 goals), J. Gardner (19 goals), M. Motteram. Yarra Glen best: M. Cowan, K. Fraser, S. Gilder. Kinglake best: A. Waack, A. Barnes (17 goals), C. Ryan. Alexandra best: E. Hedger (17 goals), R. Wallis (10 goals), L. Chapple (8 goals).